Friday is here again and the weekend is near! 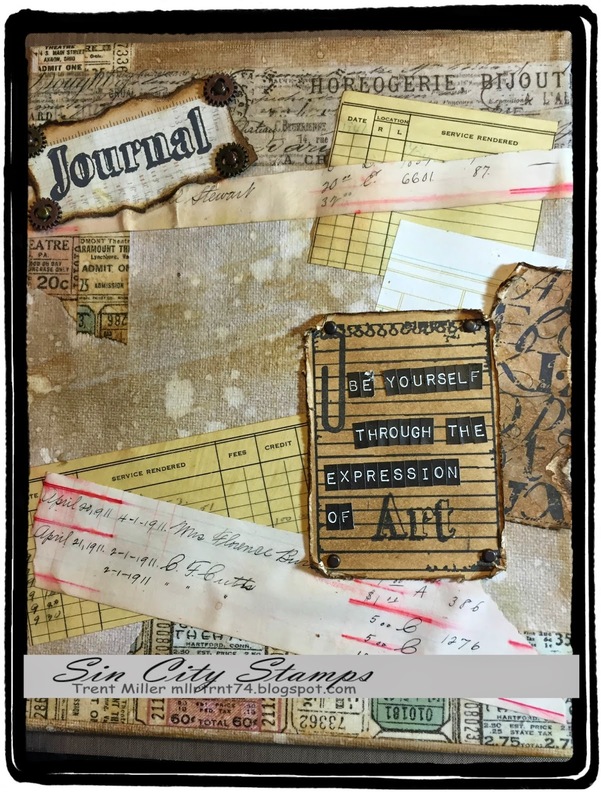 For my fellow artists & crafters I am excited so share my mixed media art journaling project. 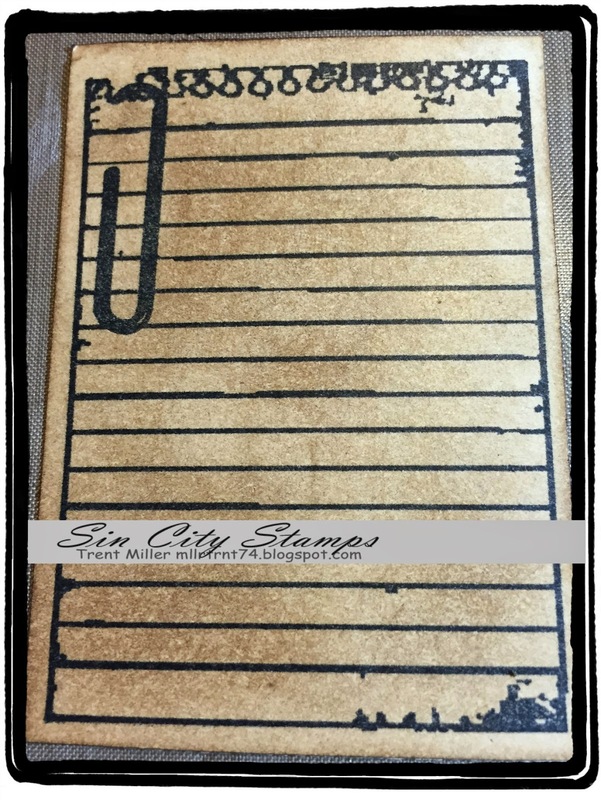 This is my second project to share since becoming part of SinCityStamps Design Team (DT). 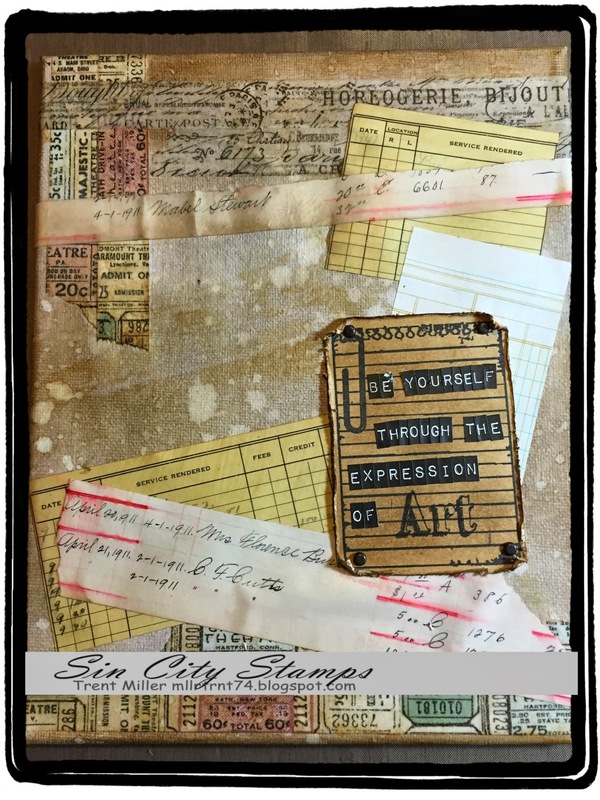 For this project I decided to make a canvas and use the Art Journal Rubber Stamp set by Terri Sproul that can be purchased from http://www.sincitystamps.com. 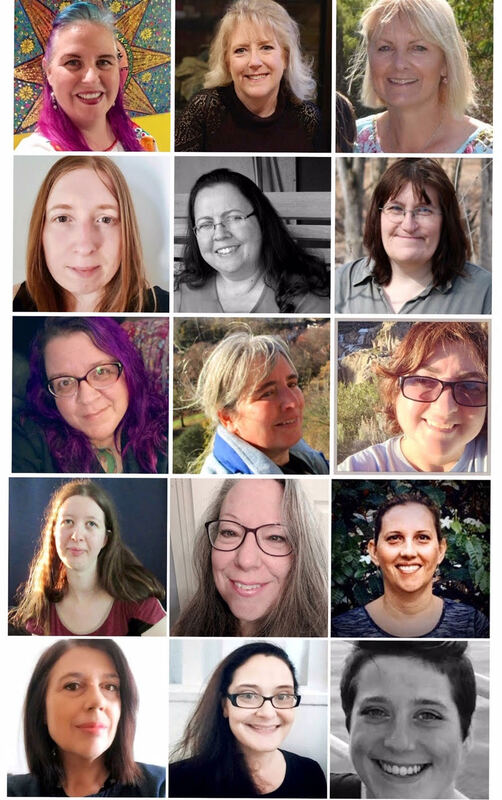 I hope you enjoy this project and join in the fun by making your very own. embellishments: mini gears, ruler ribbon, buckle, brad, metal corners, compass coin, mini corners, mini numerals, long fasteners, mini fasteners, and alpha letters. 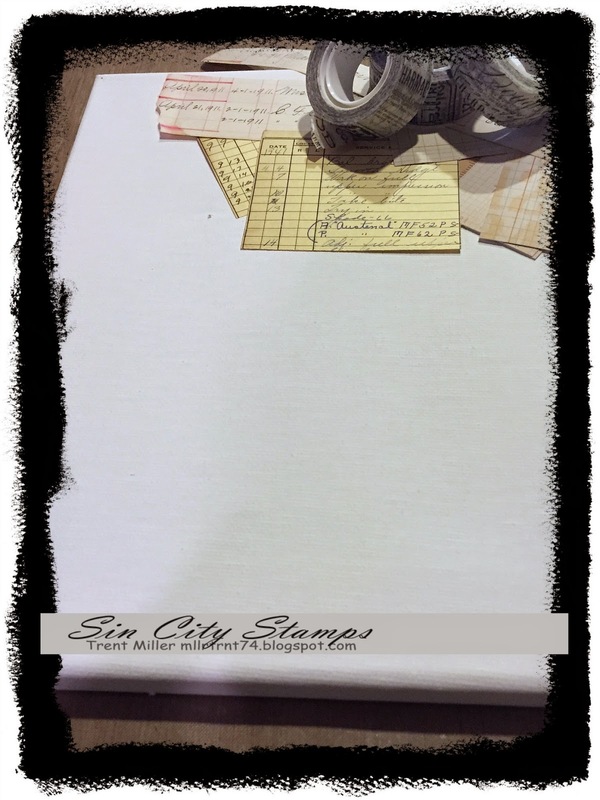 tools: craft sheet, mister, heat tool, scissors, ink blending tool, ripper, paper cutter, and craft pick. Step 2: Let's start off by running some tissue tape across the lower part of the canvas and upper left corner. Then we are going to take gathered twig distress ink (you will come to learn this is one of my favorite colors- I use it in all of my projects) and cover the canvas. Step 3: Now that we have the background of the canvas started. We will now create the water drop effect onto the surface of the canvas. Take a water mister and by water into the palm of your hand; then flick the water onto the canvas. Using your heat gun start drying the canvas and blot up the remaining water with a cloth or paper towel. Step 4: Now we need to seal the canvas because distress ink is reactive with water (or water based solutions). So we need to seal the canvas before we start attaching ephemera to the background. For this step we will use Matte Finish spray by holding the canvas and spraying the entire canvas. Then set the canvas aside to allow for it to fully dry. Step 5: Our next step is to take more tissue tape and vintage ephemera and apply this to the canvas. We first want to start by placing additional tissue tape directly onto the canvas. Step 6: Then take Matte Medium and cover the canvas. This will allow for the ephemera to sick to the canvas. The Matte Medium will also serve to seal the tissue tape onto your project. When applying the matte medium to your project use a foam brush or sponge. 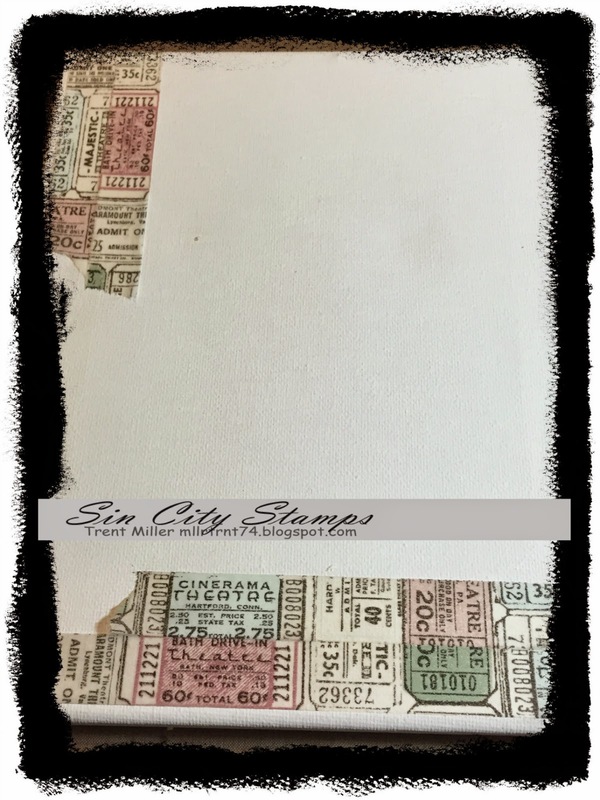 Step 7: We are now going to start placing the vintage ephemera onto the canvas and then using matte medium apply that over the top of the ephemera. 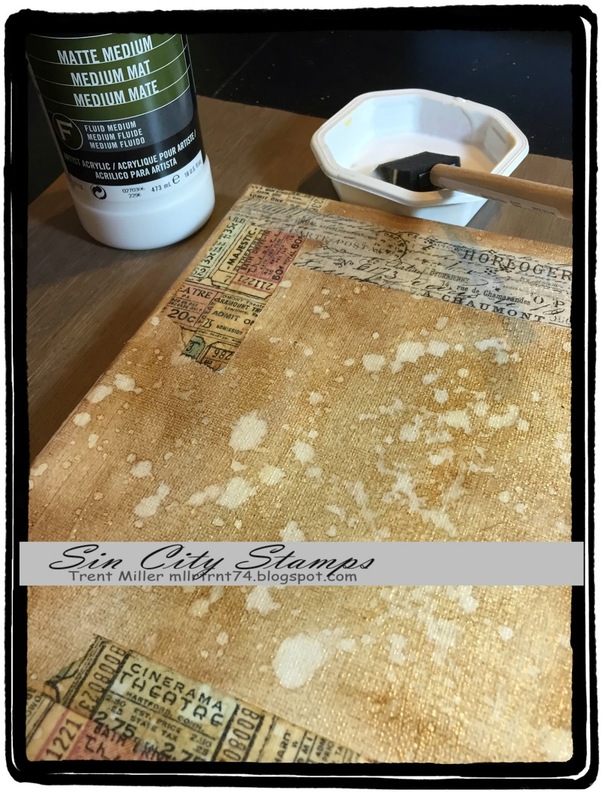 Step 8: While that dries we are going to take a #8 manila tag and using a stamp from the Art Journaling set we are going to stamp it onto the surface of the tag using black archival ink. Step 9: Now take the tag and cut it down to the size of the stamp. Allow for enough room at the edges so we can use a paper distresser to rough up the edges. 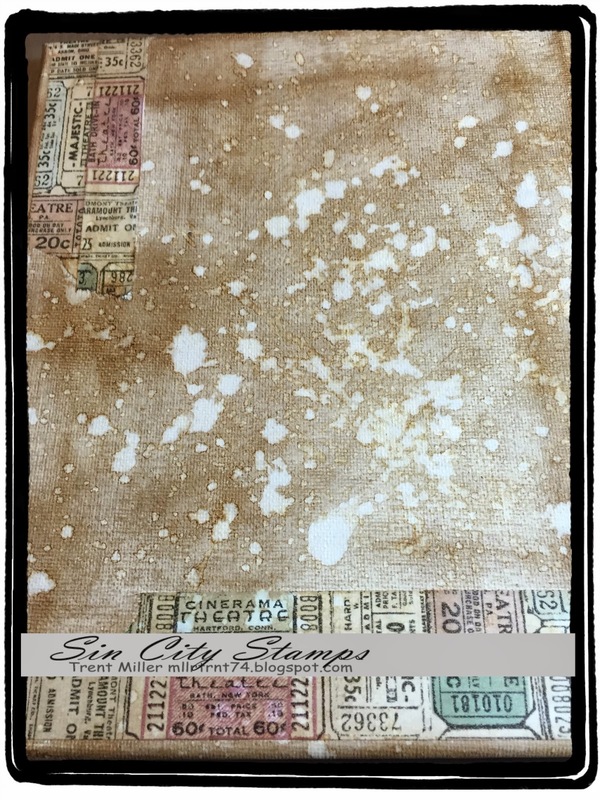 Take gathered twig distress ink and dirty up the stamped area by using a ink blending tool. Step 10: Using a paper distresser rough up the edges of the stamped image. 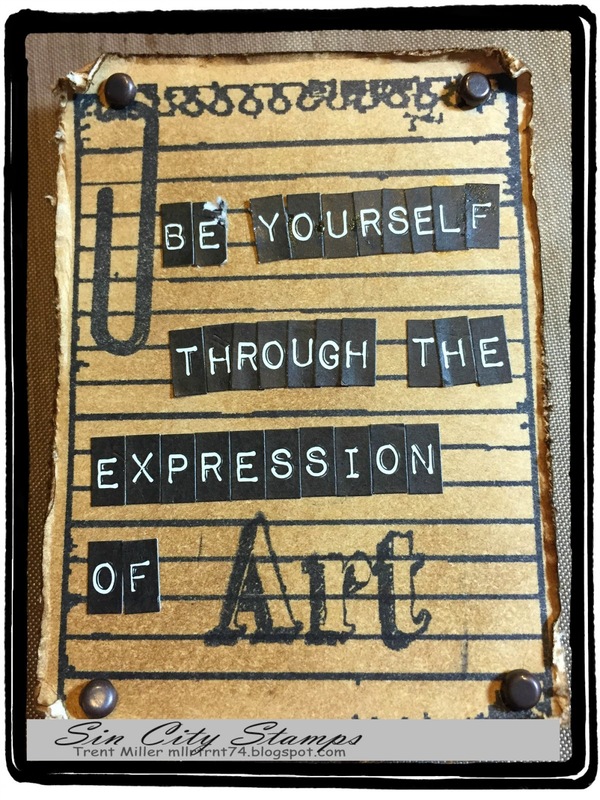 We will now take Tim Holtz idea-ology label letters and place a saying onto the stamped image. We will then apply some gathered twig distress ink to dirty up the edges. I finished it off by adhering it to the canvas with idea-ology long fasteners. 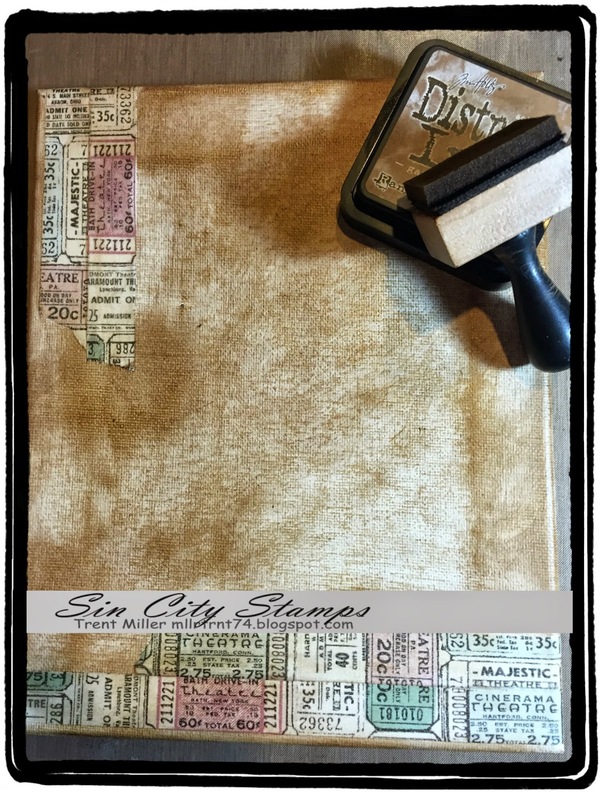 Step 11: Now let's take some ephemera and use the "Journal" stamp. 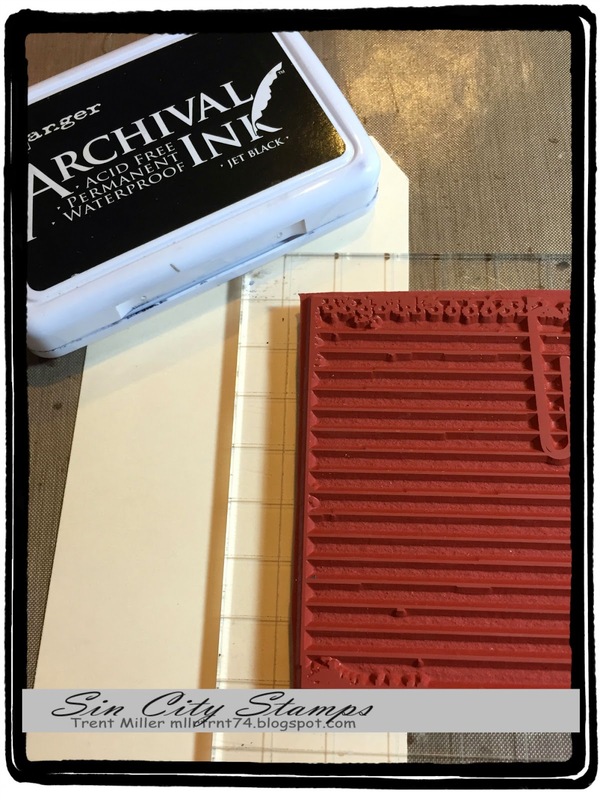 Stamp this saying onto ephemera paper by using distress embossing ink. Then using embossing powder cover the stamped image with the embossing powder. I used the Watering Can embossing powder and then used a heat blending tool to create the embossed effect. 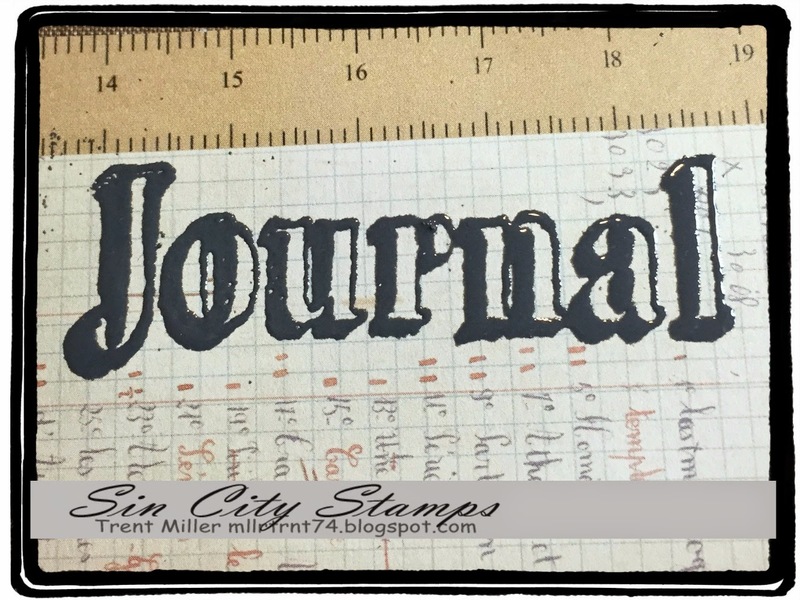 Step 12: Take the paper and tear off the sides around the embossed journal word and dirty up the edges by using an ink blending tool. I then took some embellishments to add further dimension to anchor the corners (I used mini gears). Next we will apply this to the upper left corner canvas by using double sided tape. Step 13: Now select another stamp from the Art journaling Rubber set and complete Step 8 & 9 with a different stamp to create a similar affect. 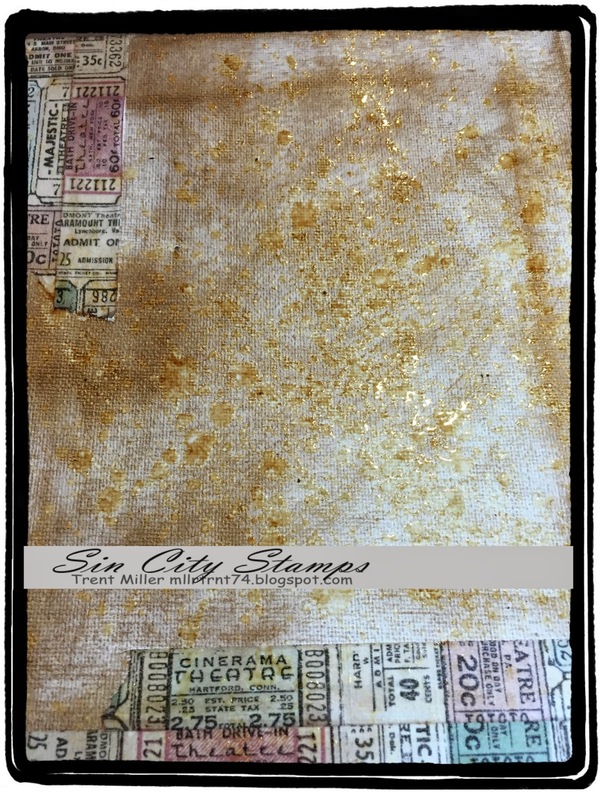 I then placed this behind the other stamped piece on the canvas with double sided tape. Step 14: I then continued this process of stamping and adding further detail on the canvas. Step 15: The final step was to take some ruler tape and a buckle to add further dimension to the piece. I then continued adding embellishments onto the canvas. You will continue this process till you feel your project is complete. Here is a picture of my finished piece. If you have any questions don't hesitate to leave me a message on how I finished off this project by use of embellishments or stamping. 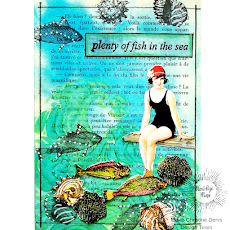 Thanks for checking out this fun canvas project and if you don’t have the Art Journaling stamp set go purchase it today. YOU WONT REGRET IT! 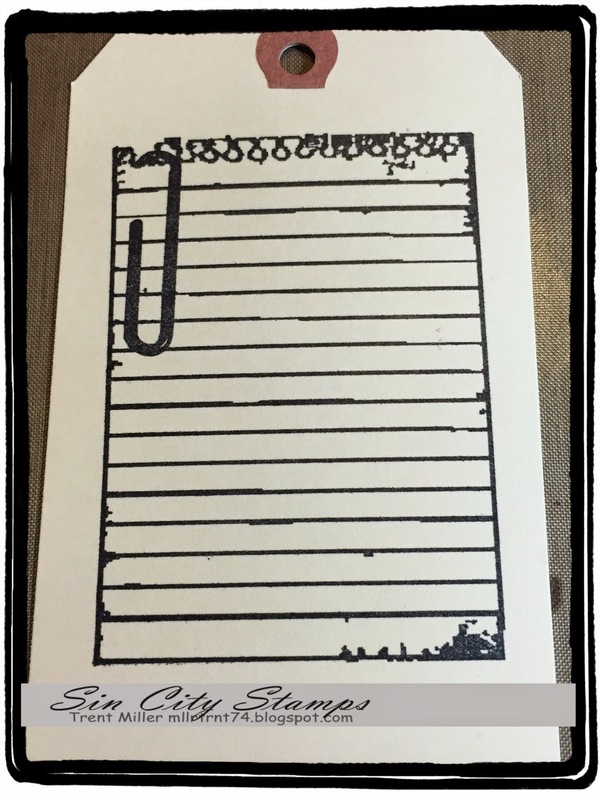 This is a must have and will be a great addition to your very own craft stash. 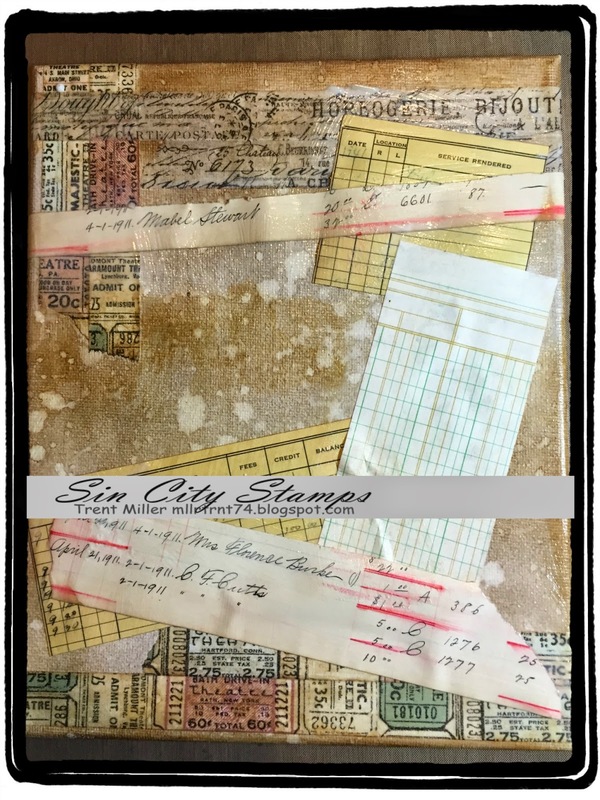 Check out the store today http://www.sincitystamps.com there is such great stamps, stencils and products that you can chose from that will be great additions to your art space. This is awesome! 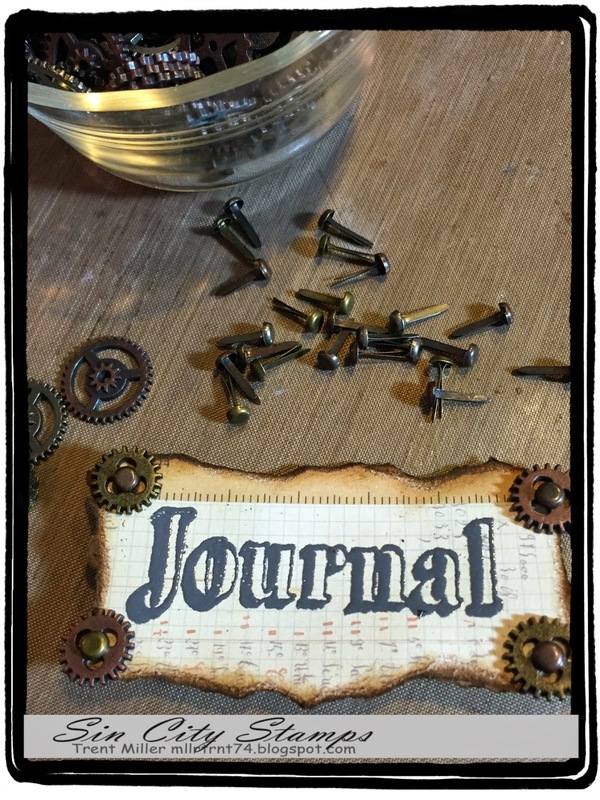 A great journal for anyone but cool enough for a guy to use =) Thank you for the step by step tutorial. I'm sorry...I know this is a canvas...I had my mind set on journal...my sister has been looking for ideas for guy journals for her nephew. Your CANVAS is awesome! LOOOVE this canvas!!! You do gorgeous work!! Fabulous canvas. Love all the elements and dimension, my favorite things. Great job! You sure know how to add the details to make this not only interesting, but attractive canvas. There is so much to look at so it captures my attention!! Love it, Trent! 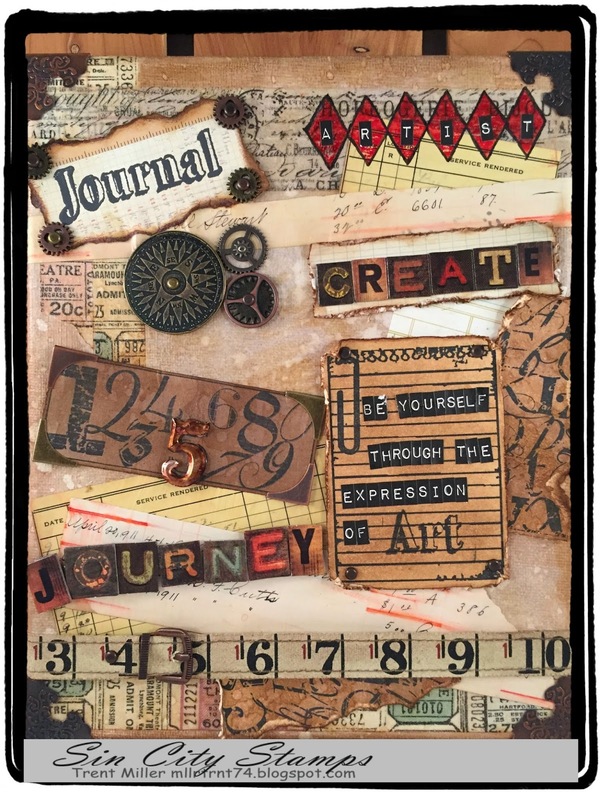 LOTS of fabulous layers, how unique to do an art journal style of canvas!